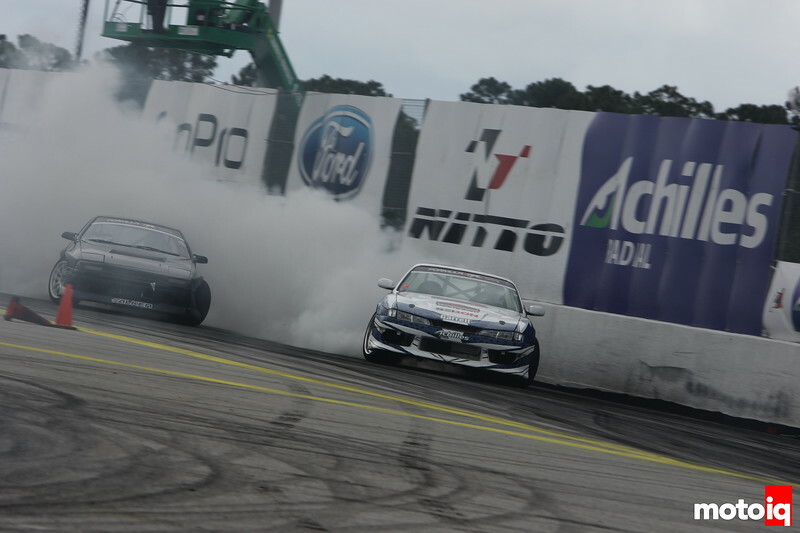 Coming off such a controversial and carnage laden Road Atlanta for Round 3 of the Formula Drift Pro Championship, you'd be forgiven for thinking that all of the zany action was behind us. Well, you'd be wrong. First the rain came pouring in on Thursday, causing that practice day to be rained out before it ended. Then came the incredible incident that Brandon Wicknick had during Top 32 Practice on Saturday causing his car to burst into flames and end his round before it even began. He's fine and the car can be repaired if he can find a rear clip. You'll hear more later. Now let's get down to business, here is your Top 32 to Finals Coverage! The first pair up were number 1 qualifier Justin Pawlak in the Falken Tires Ford Mustang and number 32 qualifier Kyle Mohan in the Energy X/Mazdatrix/Nexen Tire Mazda RX-8. Kyle struggled with the car during qualifying, but looked better in competition. 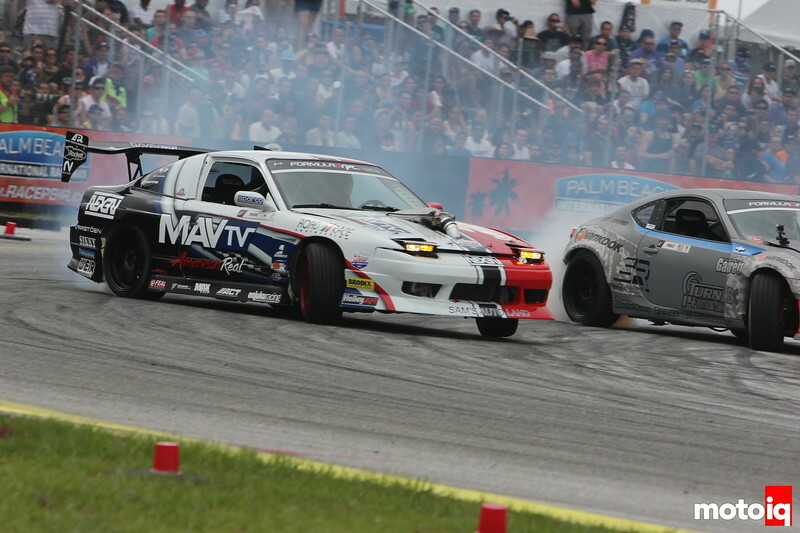 Justin Pawlak, though, was looking good from start to finish and was able to muscle out Mohan in the Pony Car! 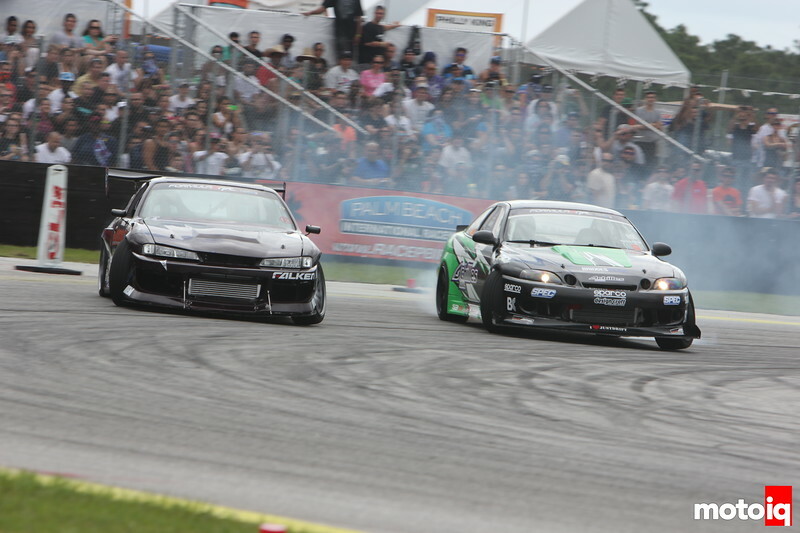 Formula Drift Rookie, Chris Ward in the Bedrock Nation Nissan S14 240SX would look to take out the monstrous Achilles Radial Lexus SC400 of Robbie Nishida. Despite the best Ward could throw at him, Chris could never find Nishida's achilles heel. Robbie moves on to Top 16. Jeremy “J-Lo” Lowe in the Enjuku RX-7 is the only RX-7 that still has a rotary installed in professional drifting. Jeremy would have a gargantuan effort against the 700+Horsepower SR20VET powered AV Fab S14 240SX of Dave Briggs. After initial struggles in the car, Dave has found his footing and was able to blow past Lowe like a badly tuned turbo rotary blows out apex seals when J-Lo spun out. Briggs was in his first Top 16 of 2013! The first controversial call of the Palm Beach round would be one of many in Top 32. Tony Angelo in the US Air Force/Turn 14/Hankook Tire Scion FR-S would face the nicest guy in drifting, Joon Maeng in the Lucas Oil/Mav TV/Nexen Tire Nissan S13 240SX. Tony was able to perform a great lead run and it really looked like the FR-S was finally dialed in, but on his follow run against Joon, Tony hit him before the final front clipping point. It sent Tony into a spin and Joon would lose his rocker panel. Based on what was observed at Road Atlanta that should have given Joon the win. Add to it that it is stressed that the lead car is to be used as a moving clipping point and Tony constantly surging and straightening against Joon should have also given Joon the win. After moments of deliberation, Tony was awarded the win and it was explained that Joon was not fast enough through the entire course. Joon tried to file a protest but forms have to be printed and cash given in order to do so. Without either, Joon’s request could not be answered per Formula Drift rules and Angelo moved on.